So you’ve decided to take up painting. Good for you! Painting is an amazing relaxation exercise that serves as a great creative output. Accessible and interesting, you can simply pick up a brush for 30 minutes, or while away several hours if you have the time. 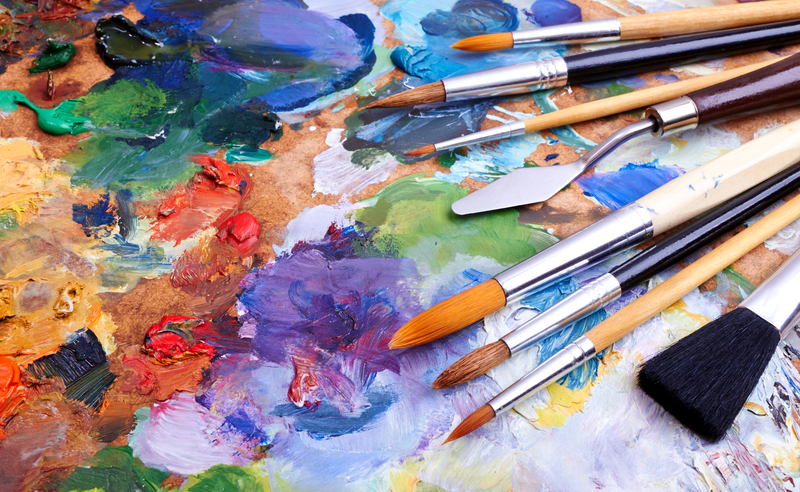 Painting comes with it a wealth of benefits, from increased creativity and memory to improved communication skills, problem-solving skills and emotional intelligence. Painting enhances the senses, gives you greater mobility, reduces stress, and makes you become more aware of the little details in life. In other words, you’ve done the right thing by deciding you want to start painting. Now… where to begin? At Discount Art N Craft Warehouse, we know that every painting journey starts with the right equipment. So what essential materials should you have in your toolkit when you get started? If this all seems too hard and you’re not too sure about picking your own colours, consider a beginner’s set, which should contain all the colours you need to create your first ever masterpiece. The best paint brushes to start with are natural bristle brushes, namely hog brushes, hogs’ hair brushes, and bristle brushes. Bristles should be long and should have a bit of spring. Your brush should hold a good lot of paint, have a good strong handle (longer is better) and should retain its edge and shape after repeated use. Quality is key here – cheap brushes rarely retain their shape and can splay after use. Synthetic brushes are fine when working with acrylics, so long as they are quality. In fact, synthetics tend to be softer, making them good for glazing and subtle blending. Just bear in mind that you won’t be concentrating on this when you first start out. Now, the thing about a good brush is that there’s more to think about than simply what it’s made of. There’s also shape and size. For acrylics, there are 8 main shapes of paint brushes, each suited to different techniques. As this can be confusing, try to break them into two groups: flat or regular and round or pointed. Flat and regular brushes have a square, flexible end and hold a lot of paint. When used flat, they make long strokes and are good for blending and painting in large areas. Tips and sides can be used to create delicate lines and touches. Your round and pointed brushes have a large belly that tapers to a fine point. They are great for creating bold strokes that cover large areas, however, can also render fine lines and details. In terms of size, start off with mid-size brushes (size 6-8) and then branch out according to the needs of your painting style and budget. If you want to, you can pick up a house paint brush, which will be good for preparing your surface with gesso. Non-porous surfaces are your best bet for beginners using acrylic paint, but the rules generally stop there. You can choose paper specially designed for use with acrylics, canvas or wood. Do consider that your surface shouldn’t break the bank – it’s your first go after all. 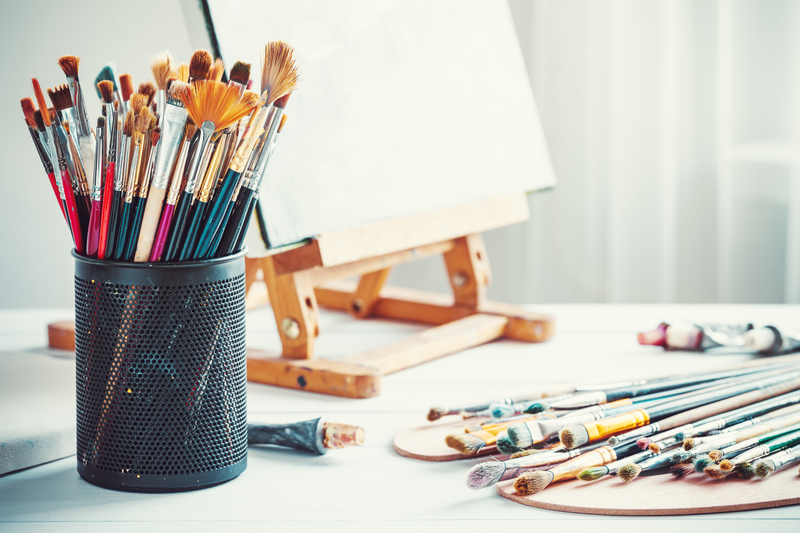 At Discount Art N Craft Warehouse, we offer a range of affordable stretched canvas, panels and boards, and depending on the size of your surface, you may want to look at using an easel too. You’ll need a surface in which to mix your paint and a palette is just the thing. The type of palette you choose will be dependent entirely on your own taste. Traditionally, palettes were a wooden board in which you could place your thumb through and hold by your side, but you may prefer something you can place on a nearby table. You may like to work with disposable plastic palettes, or you could even just use a large sheet of glass. As well as a palette, you might want a palette knife and a paint scraper. We mentioned gesso above and how it’s used for preparing your surface for painting. Gesso is essentially the “ground” on which you build your masterpiece upon. Even if you buy canvases of the prefabricated kind, you should still apply an extra layer of gesso. Gesso ensures the paint will adhere and that it won’t penetrate the fibres on your canvas and rot it. It can also be applied to masonite panels and wood. Start with white gesso (it also comes in clear and black) and experiment with other types or tinting down the track. Mediums are an important part of painting yet they are often overlooked by beginners. Painting mediums are what you mix your paint with to help it flow, but they also serve specific functions such as adding gloss, translucency, and thickness/body to your paint. The basic medium for acrylic paint is water, however, choosing a glazing medium or retarder that slows the drying time can be beneficial when you’re learning and likely to make mistakes. You may also like to try mixing a soft or heavy gel gloss into your paint for extra body. Before you start your painting, you’ll most likely want to draw out your subject. All you need for this is a 2B pencil for general sketching and shading and a 4H for light areas. Alternatively, you could buy a pack of sketching pencils. You’ll also need a kneaded white eraser that won’t leave any residue behind. Save old sheets and t-shirts, anything that’s cotton, and rip them up for rags. You’ll need them for cleaning your brushes and hands, wiping paint from paintings, and mopping up spills. You should also have some paper towel on hand and some old jars or yoghurt containers. And there you have it – your very first painting toolkit! Make a note of everything we’ve suggested, and add your items to Discount Art N Craft Warehouse’s online shopping basket. Standard shipping will have your items with you in 3-5 working days and then your painting journey begins!